"Art is about exercising your freedom"
I never thought about art that way but at the same time, the word freedom has always been in the back of my head ever since the day I decided to become more creative. And it makes sense. Art is many things, and one of these things is to be able to express yourself, explore what intrigues and interests you and thus exercising your freedom to be yourself. I take the word "art" in a broad term. Art can be cooking, painting, teaching, acting, singing, dancing, building things, coding, etc. Whatever you're passionate about, whatever you're into, that's your art. When you do that, you're exercising your freedom. "It's not about the object"
Another great point from Koons is that art is about people, not the object. It's about how it affects people who come in contact with it. There's an inherent connectivity that takes place when you create good art. This makes it easier to understand why certain art pieces will be more popular than others and it has nothing to do with the degree into which the artist is able to reproduce reality. That's why famous artists include Picasso, Salvador Dali, Claude Monet, Jean-Michel Basquiat and Leonardo Da Vinci. Something about their art resonated with people. I guess that's why now I can't really criticize any other artists work. Either I understand and connect with it or not, but I can't say that it's bad. Not all art is for all people. The best thing you can do as an artist is get involved, get your hands dirty. Start and see where it takes you. 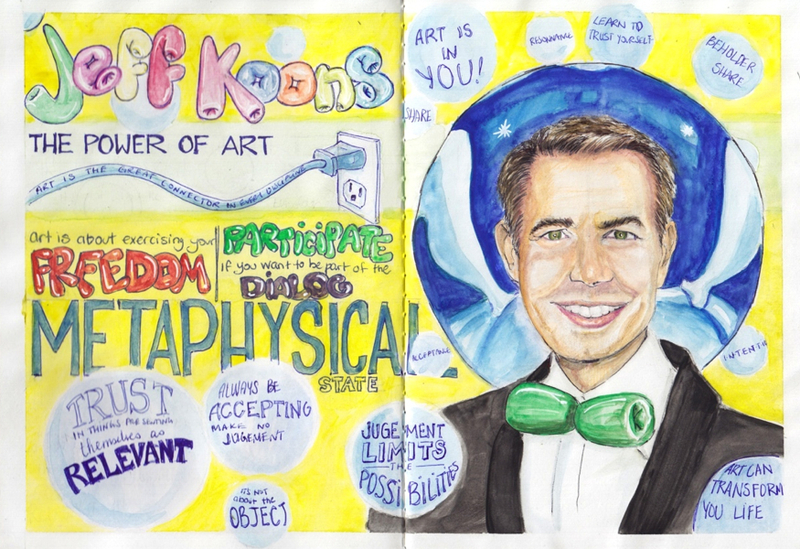 This is what Jeff Koons did and that's one of the reason he's where he is today. He trusted in himself, he didn't judge the process, he had good intensions and he participated. There's a lot of good to take from this interview. Enjoy. [EDIT : March 2015] I recently was contacted by someone over at Artsy who thought you might enjoy seeing an extensive collection of Koons' work. If so, click here to head over his page on Artsy.